Madrono is native to the Golfo Dulce region of Costa Rica, the Atlantic slope of Panama, and northern South America–Colombia and Ecuador through Venezuela to Guyana and Bolivia. It is particularly common in the Cauca Valley of Colombia where the fruits are marketed in quantity. 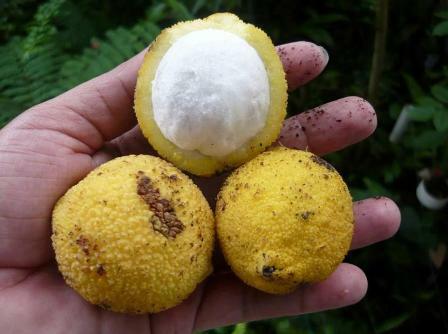 This fruit is not known much outside its homeland. However, madrono has reached USA and is planted by some people in their backyards in Florida. 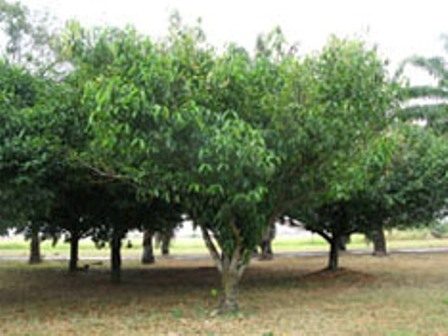 An erect, lush, compact evergreen tree with pyramidal or nearly round crown, 7-20 m high. 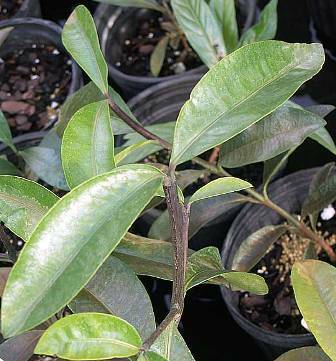 Leaves opposite, elliptic to oblong, wedge shaped at the base, rounded or pointed at the apex; 7-20 cm long, 2-8 cm wide, dark green from dorsal side and paler from ventral side, with numerous veins conspicuous on both surfaces and merging into a thick marginal vein. 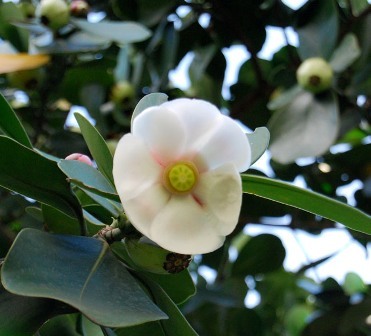 Male and female flowers borne on separate trees in clusters of upto 14, flowers are fragrant, 4 reflexed, petals pale yellow, 25-30 light yellow stamens in male flowers. The fruits are sweet and tasty. These are eaten fresh by local people. These are also offered for sale at some places. In addition to being eaten as a fresh fruit, madrono fruits also make excellent jam, jelly and preserve. Madruno is well adapted to a wide variety of soils, tolerating even poor soils or heavy clay. It is a slow grower and takes about 5 to 7 years to fruit. When young, it must be protected from freezes and it will not fruit in cold areas. One word of caution, though: do not pick fruits prior to maturity. If picked prior to maturity, fruits are generally very acid, and once picked no further ripening occurs in the fruit.